It's a new challenge at Joy Clair and this month is all about summer. I've use the Butterfly Kisses stamp set. This is one of my favorite stamp sets. The possibilities of creating with it are endless! 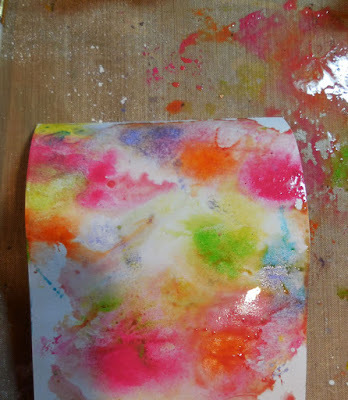 I created the background by running white cardstock through watered down reinkers that were dropped on a craft mat. I then spritzed the panel and watched the inks move around the panel. I matted the panel with green cardstock. 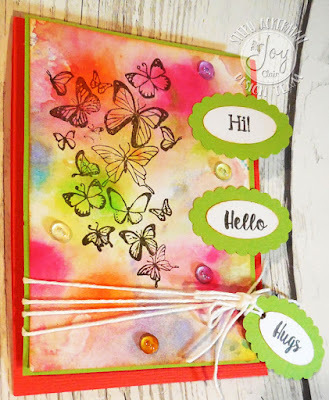 The butterflies were stamped with gray ink then the panel was wrapped with Whiskers Graphics twine. The panel was added to the salmon colored card with foam adhesives for dimension. 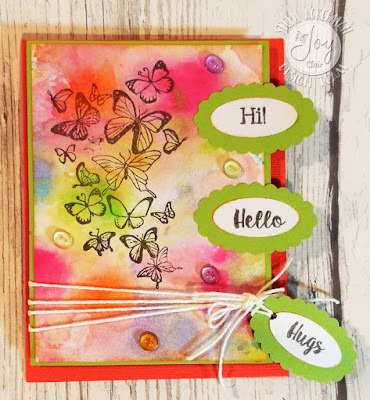 The words were stamped on white cardstock then punched out and added to scalloped ovals. I randomly added some dew drops from the Robin's Nest about the panel. Remember to stop by the Joy Clair blog to see everyone's projects. Beautiful card Steph! I love those butterflies and your background turned out beautiful! I would love to make this. Beautiful... Love your paper!